El Mercado is located in the heart of Cusco. Featuring original and eye-catching interiors and exceptional customer service that starts right at the very beginning of the adventure,in Cusco itself. Mercado is the Spanish word for market, and El Mercado occupies the premises of a former market located only a couple of blocks from Cusco’s main Plaza de Armas. A market is an expression of a town’s culture and traditions, a space where these may be appreciated, fostered, and protected. Visiting a market is an effective way of obtaining a deep and lasting impression of a city, a place where its pulse may be felt. 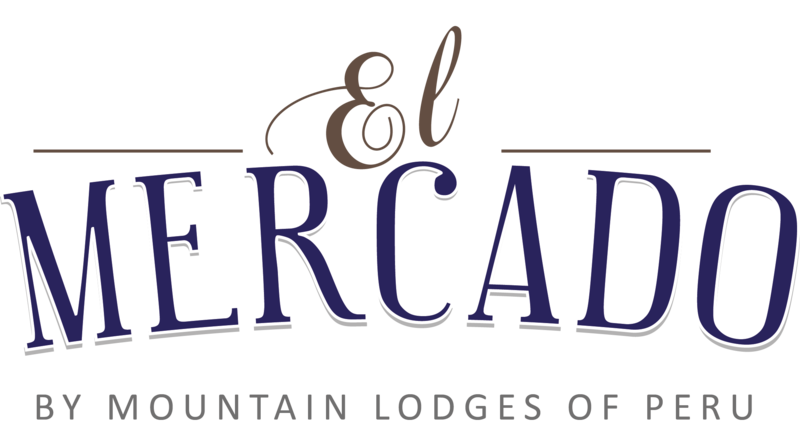 Just as the countryside’s best products are brought to a market, El Mercado brings the magic of the Apus—the spirits of the mountains—to the city. The hallmarks of the Mountain Lodges of Peru experience—exceptional service, warm Peruvian hospitality, and attention to details—are found at El Mercado, creating a perfect beginning for any journey into the beautiful landscapes and fascinating cultures of Peru. Mountain Lodges of Peru offers a mixture of adventure and comfort on one of Latin America’s most exciting trips: a seven day journey on foot or by horse along the famed Salkantay trail that brings the traveler from the high Andes to the edge of the cloud forest. Four well-appointed luxury mountain lodges welcome travelers at the end of each day. The well earned prize at the end of the journey is an unforgettable visit to the magical ruins of Machu Picchu, the legendary lost citadel of the Inkas.